Voters on 19 islands off the west coast today became the first to go to the polls in the European and local elections in Ireland. The population of Inishbofin, off the Donegal coast, had 64 people entitled to vote and saw a final turnout of 35 voters, or 54.68%. Voting was held from 11am to 3pm on the island. Almost 2,600 people on the islands off the coasts of Donegal, Mayo, Galway and Cork got to vote ahead of the rest of the country. It is a traditional practice to ensure ballots are returned to the count centres on the mainland in time for counting with the rest of the papers. Ballot boxes, returning officers and gardaí were taken to the various islands by boat or Air Corps helicopter. The largest electorate is on Inis Mór in Galway where 626 people are registered to vote. The smallest electorate is on Innisfree in Co Donegal where there are just seven people on the register. Elsewhere, voters in Northern Ireland are going to the polls today to select three representatives for the European Parliament. The SDLP, Alliance and the Greens are also contesting the election. Seven candidates are contesting the election. They are Stephen Agnew of the Green Party, Mr Allister of Traditional Unionist Voice, Ms de Brun of Sinn Féin, Diane Dodds of the DUP, Alban Maginness of the SDLP, Mr Nicholson of the Ulster Conservatives and Unionists, and Ian Parsley of the Alliance party. Polling stations opened at 7am and close at 10pm. The eligible electorate in Northern Ireland is 1,141,979, an increase on the 2004 figure of 1,072,669. 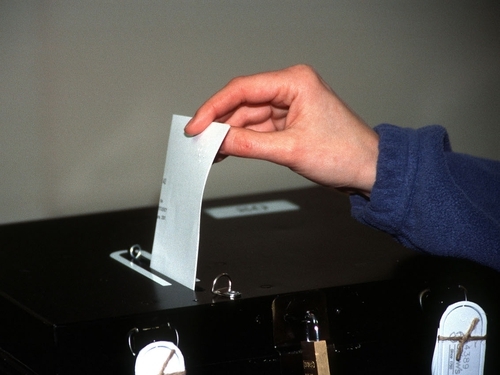 Votes will be verified at the King's Hall in Belfast tomorrow, before counting starts on Monday morning.